LEICESTER: SANITATION versus VACCINATION BY J.T. 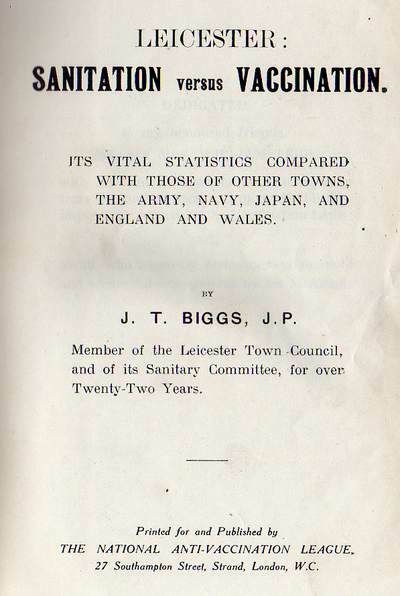 BIGGS J.P.
a 1912 book BY J.T. BIGGS J.P.
[One document] LEICESTER: SANITATION versus VACCINATION BY J.T. BIGGS J.P.
CHAPTER 80. LEICESTER AND SMALL-POX- 1902-04. [Extract CHAPTER 82] The sanitation procedure under the "Leicester Method"
CHAPTER 92: Professional Opinion on the In vaccination of Syphilis. CHAPTER 98: " Lymph." What is "vaccine lymph"? CHAPTER 99: "Glycerinated Calf Lymph." CHAPTER 100: How " Glycerinated Calf Lymph " is "Manufactured." CHAPTER 101: Dr. Klein's Microbic Experiments. CHAPTER 102: "Small-Pox Virus Vaccine." CHAPTER 94: Inoculation Experiments—Tuberculin and Leprosy. CHAPTER 95: Vaccination and Tuberculosis. CHAPTER 96: Diseases Injected, Intensified, and Increased by Vaccination and Inoculation. CHAPTER 97: Inoculable Diseases—England and Wales. CHAPTER 112: The "New " and the "Old " Tuberculins. CHAPTER 115: The " British Medical Journal " and Tuberculin. CHAPTER 116: The Royal Commission on Tuberculosis.